Archbishop Donald J. Bolen was installed as the eighth archbishop of the Regina archdiocese on October 14th, 2016. He took as his motto, “Verbum Vitae/ Mercy within mercy within mercy”. 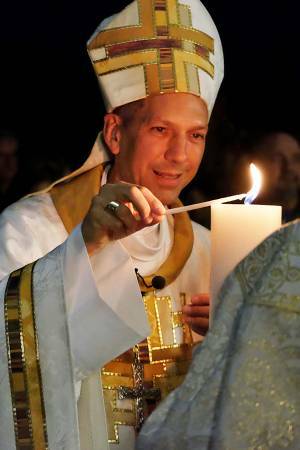 Archbishop Don’s work is supported and informed by the Archdiocesan Office, the Archdiocesan Curia, the Archdiocesan Pastoral Council, the Archdiocesan Committee for Truth and Reconciliation, and more. In consultation with staff, lay leaders, religious women and clergy, Archbishop Don has set the current Archdiocesan Priorities. The Archbishop’s Calendar can be viewed here. Archbishop Don's letters and other writings can be read here, and selected homilies can be read here. February 7, 1961: Born in Gravelbourg, Saskatchewan. the son of the late Joseph (+1968) and Rose (+2006) Bolen. Staff member at the Pontifical Council for Promoting Christian Unity, Rome, staffing Anglican-Roman Catholic and Methodist-Roman Catholic relations and the preparation of texts for the Week of Prayer for Christian Unity. Served as Co-secretary of the Anglican-Roman Catholic International Commission (ARCIC), the Anglican-Roman Catholic Commission for Unity and Mission (IARCCUM) and the Joint International Commission for Dialogue between the World Methodist Council and the Catholic Church. 2009 to present: Member of the International Consultation Between the World Evangelical Alliance and the Catholic Church. 2011 to present: Co-Chair of the International Anglican-Roman Catholic Commission for Unity and Mission. 2013 to present: Co-Chair of the Joint International Commission for Dialogue between the World Methodist Council and the Catholic Church. 2008: Awarded the Cross of Saint Augustine by Archbishop of Canterbury Rowan Williams for service to relations between the Catholic Church and the Anglican Communion (2008). 2014: Honorary Fellow of the College of Emmanuel and St. Chad, University of Saskatchewan. At the centre of Archbishop Donald Bolen’s Coat of Arms is the open word of God, an echo of the open book of the Gospels being held over his head when he was first ordained a bishop. On the book is the Latin phrase “Verbum Vitae,” that is, “the Word of Life.” The text comes in the first instance from the First Letter of John: “We declare to you what was from the beginning, what we have heard, what we have seen with our eyes, what we have looked at and touched with our hands, the word of life...” (1 Jn. 1:1). St. Paul also admonishes his hearers to “hold fast to the word of life” (Phil. 2:16). The shepherd’s crook – a bishop’s staff – represents the apostolic calling to be a good shepherd, to feed the sheep, to take care of the lambs (Jn.10; Jn. 21). The shell is abundantly present in the iconography found within the Oratory of St. Francis Xavier “del Caravita” where Bishop Bolen served on the pastoral staff during his years in Rome, and symbolizes Baptism. Both the shepherd’s staff and the shell also symbolize being a pilgrim in a pilgrim Church. They speak directly of the camino to Santiago de Compostela which the Archbishop walked in preparation for his ministry in the Archdiocese. The wheat sheaf, against the blue backdrop, speaks in the first instance of the Saskatchewan prairies, the vast sheltering skies beneath which we live, and the dignity of a way of life closely tied to the land. Jesus also speaks of his own paschal mystery in terms of the grain of wheat which falls to the ground and dies, and bears much fruit (Jn. 12:24). Wheat is also thus a symbol of the Eucharist, of the Lord’s invitation to receive his life-giving presence into our lives, to allow our lives to be broken and poured out for others. Alongside the shell, it speaks of the sacramental life of the Church, and also of ecumenical efforts to come to a shared sacramental life. 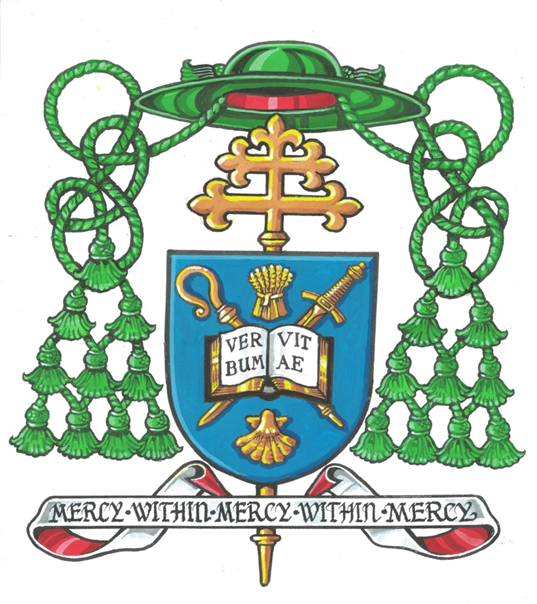 The hat with ten tassels on either side and the cross are emblematic of the hierarchical status of the episcopal office, and are present on every Roman Catholic archbishop’s coat of arms. The Cross with the fleur de lis, like every cross, symbolizes the paschal mystery, the saving death and resurrection of Jesus. The fleur de lis is also a symbol of French and francophones, and thus of Gravelbourg, the hometown of Archbishop Donald, and of the francophone communities within the Archdiocese.